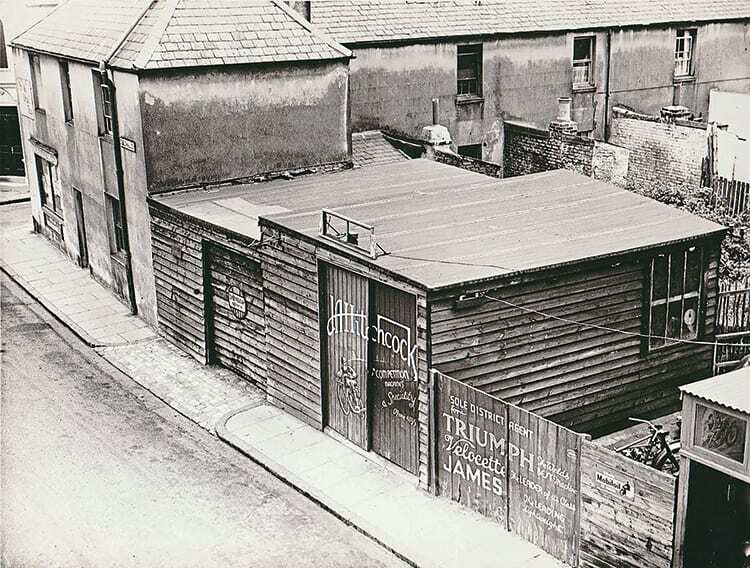 The original shed in Guildhall Street where it began in 1932. The adjacent shop came up for sale and Jock acquired it and soon packed it with stock. Don Hitchcock’s last motorcycle journey was clocked from the pillion of the hearse by grandson Matt at 65mph on Wednesday, September 14, 2016. One last blast; a fitting memorial to a life centred around family, motorcycles and speed. Originally, it was my intention to write a tribute solely to Don, but this was not possible without reference to his father Jock, as the two were bound so closely together through their J A Hitchcock and Son motorcycle dealership and associated motorcycling activities. John Angus Hitchcock, known to all as Jock, had one passion: motorcycling. Happiest riding (or working on) his beloved Triumphs, he soon became a well known local figure, founding the ‘Folkestone Motorcycle Club’ in 1926 at the age of 20 and as a regular entrant in local competition events. As his prowess grew, he took part in long distance and endurance events. Legend has it after the 1929 Scottish Six Days Trial, he turned his bike around and rode home to Folkestone, nearly 500 miles, in a day, no mean feat 90 years ago. At one time, he also held the Brands Hatch short circuit record. Jock and Don are synonymous with the Folkestone motorcycle dealership that bears their name. ‘J A Hitchcock’ was founded in 1932 by Jock on the site of a former grocery shop. The business soon acquired the regional agencies for Triumph, Velocette and James. The tag ‘and Son’ was added in honour of Jock’s two boys. Jeffrey, the elder son, was killed during the 1950s in a motorcycle accident on his way back from the Triumph factory at Meriden. His death deeply affected the family and effectively put paid to Don’s ambitions to train as a vet when Jock asked him to join the business while in his teens. Hitchcocks expanded rapidly, catering for the needs of the pre Second World War motorcyclist, offering services from a replacement bulb, to a full service and, if you had the money, a ‘Hitchcock Special’ that Jock began building a year after he started the business. His first ‘Special’ was powered by a Blackburne engine. During its first race, Jock was leading and well into his stride when a fuel line ruptured and the bike caught fire. The swift actions of the circuit’s ice cream vendor in dowsing the flames with freezer ice saved the machine.